Designed to produce radiographic images of the breast, mammography x-ray systems are primarily used for breast cancer screening, staging and grading, and pinpointing specific diagnoses in patients displaying symptoms. Most mammographs show magnified views of the breast, as well as spot images. Special stereotactic attachments facilitate performing stereotactic biopsy procedures. Digital mammography images can be achieved either by a full-field digital detector, or by using CR cassettes and a CR reader. Also, a small-sized digital detector can be integrated into an analogue mammography for image spotting and for of guiding stereotactic biopsies. Clinical studies have been reported and generally suggest that digital mammography provides either equal or better imaging performance than film or screen imaging. 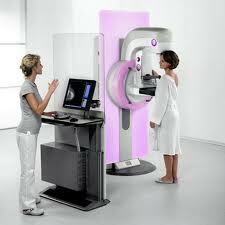 Digital mammography systems usually have a deeper dynamic range. It is important to note that pixel size is not a good indicator of spatial resolution, as the noise and blurring effects in the detector system can have a significant effect on resolution. In addition, different types of detector technologies have different noise and blurring characteristic.